Medi Guard PF Vinyl Exam Gloves Lg. Medi Guard PF Vinyl Exam Gloves Lg. 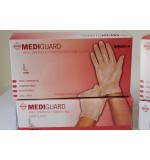 100/Bx, ..
Medi Guard PF Vinyl Exam Gloves Lg. 100/Bx, 10Bx/Cs, ..
Medi Guard PF Vinyl Exam Gloves Med. Medi Guard PF Vinyl Exam Gloves Med. 100/Bx, 10Bx/Cs ..
Medi Guard PF Vinyl Exam Gloves Sml. Medi Guard PF Vinyl Exam Gloves Sml. 100/Cs, 10 boxes per case ..
Poly-Vinyl Exam Gloves, Powder Free (Non Latex Vinyl) Large, 100/box, ..
Poly-Vinyl Exam Gloves, Powder Free (Non Latex Vinyl) Large, 100/box, 10 box/case, 1000 gloves/case ..
Poly-Vinyl Exam Gloves, Powder Free (Non Latex Vinyl) Medium, 100/box, ..
Poly-Vinyl Exam Gloves, Powder Free (Non Latex Vinyl) Medium, 100/box, 10 box/case, 1000 gloves/case ..
Poly-Vinyl Exam Gloves, Powder Free (Non Latex Vinyl) Small, 100/box, ..
Poly-Vinyl Exam Gloves, Powder Free (Non Latex Vinyl) Small, 100/box, 10 box/case, 1000 gloves/case ..
Poly-Vinyl Exam Gloves, Powder Free (Non Latex Vinyl) X-Lg, 100/box, 10 box/case, 1000 gloves/case ..
Poly-Vinyl Exam Gloves, Powder Free (Non Latex Vinyl) X-Lg, 100/box, ..